This week’s Photo Challenge theme just popped up in my email: Ocean. Ah! In Chile that’s a piece of cake! Here’s a favorite, taken from a small plane over the Pacific Ocean just off the coast of Colchagua in central Chile. This shot is from an older post with other aerial shots taken from a small propeller plane during a working trip to the Colchagua Valley. 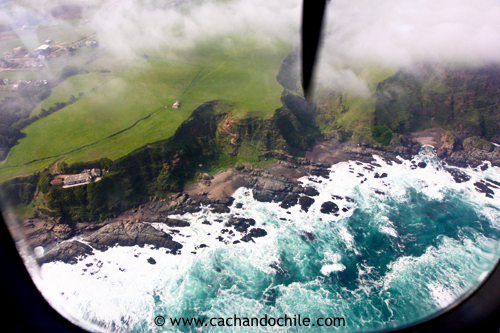 See the full post at: Chile by Air (and the coolest job in the world). Want to see what other people posted on the “Weekly Photo Challenge: Ocean” theme? Start at The Daily Post and then follow the links left in the comments section. Enjoy! This entry was posted in Nature, Photography and tagged arial photo, Chile, Colchagua Valley, Pacific Ocean, photography, PostaWeek2011, WordPress Weekly Photo. Bookmark the permalink. Great photo. On my next life I’ll be a pilot. Nothing in this whole entire world makes me feel better than being up there with the birds, and the clouds. Thanks… and couldn’t agree more about high in the sky! I have no problem with vertigo and just love having a bird’s eye view! I bet you’ll have something interesting to show on the topic too! I know you like the ocean! Fantastic view of the ocean from above! Barb19: Thanks! and loved your spring-themed lambs last week! Frizztext: Thanks- great ocean-themed shot from Greece–and thanks for adding my link! Lovely photos. One spelling correction: the name of the town is Bucalemu. Muchas Gracias! Chile is a very photogenic country! wow, what a superb pic , amazing one , but i thought about this pic that its showing like Tsunami awareness. I love the saturated colors of the green and blue…and chile is on my bucket list, it looks like a gorgeous country to visit! Beautiful aerial shot. Thanks Desiree! And Chile should be on EVERYONE’s bucket list! I came for 6 weeks and have stayed for 20 years! Still loving it too! Will definitely have more Chile photography coming up soon!